The global fire system that makes fossil-fuelled transport of pulp or palm oil possible is the same one that results in the palls of smoke over thousands of hectares of burning Indonesian forest land. Today, a capitalist conception of fire dominates. But vernacular conceptions continue to evolve and struggle against it. Learning and unlearning have always been key to supporting struggles to defend forests. Learning from forest-dependent people how they protect their territories and livelihoods. Unlearning destructive doctrines advocated by many economists, professional foresters, state officials, even well-meaning environmentalists. Sometimes what has to be unlearned are uses of the simplest words. Prevailing definitions of many other “simple” words also often need to be unlearned – or at least put in a new perspective. Otherwise, they risk becoming little more than a residue of political defeats. For example, the word land today connotes geometric blocks of space that can be monopolized by faraway private owners. But that became possible only because of hundreds of years of political aggression involving property law, fence technology, banking and the rise of powerful states. Similarly, words like work and job today refer mostly to wage labour only because unpaid livelihood activities have been systematically devalued and degraded while salaried work has become dominant worldwide, thanks to (among other things) petroleum, patriarchy and plantations. Such battles continue. Today, the Food and Agriculture Organization (FAO), obedient to corporations and states, is still fighting to include industrial tree monocultures in the definition of forest. But such fights will never be over. Defeats can never be more than partial. Forest movements’ efforts to reclaim basic words as spaces for their own ways of thinking and living reflects not nostalgia, but its opposite: an understanding that that concepts forged in conflict can be – and are being – reforged. One such concept is that of fire. Today, a capitalist conception of fire dominates the world. But vernacular conceptions continue to evolve and struggle against it. Climate change makes the stakes higher than ever. Under capitalism, fire moves from the open landscape into boilers, turbines and combustion chambers. At the same time, the open fire used for thousands of years to create and maintain forests and agricultural fields becomes suspect, denigrated, even criminalized. A vastly more intense, destructive, fossil-fuelled fire inside engines and turbines, meanwhile, becomes a sign of civilization and progress, together with the extraction and waste that accompanies it. So when you turn on the TV during the dry season in the tree plantation zones of Chile or Portugal or the state forests of western North America, you can count on seeing scary reports about uncontrollable wildfires and the outlaws rumoured to be behind them. The reports never mention the fossil-fuelled fires that simultaneously rage invisibly inside every local automobile and thermal power station. Fires that – despite global warming and the devastation that accompanies fossil-fuel extraction – no one would ever dream of regarding as criminal. Nor do the reports mention that these two problematic phenomena are merely opposite sides of the same coin. They don’t mention that the process of pushing farmers and forest dwellers off their lands – where they often will have used carefully-controlled burns to keep levels of dangerous combustibles low and levels of fertility and animal habitat high – is the same one that concentrates them around the fossil-fuelled machines that use and channel their labour. They don’t mention that the global fire system that makes fast, fossil-fuelled international transport of paper pulp or palm oil possible is the same one that results in the palls of smoke that hang over thousands of hectares of burning Indonesian forest land. Nor do they mention that the industrial distribution of fire responsible for the traffic and polluted air in cities like Los Angeles, Sydney or Quito is the same one that allows too much plant growth to accumulate in the surrounding landscapes, making inevitable the savage wildfires that periodically rip through such cities’ suburbs. Climate policy makes the way fire is organized today even more perverse. Most climate policymakers are implicitly guided by the simplistic idea that global warming is caused by fire in the abstract. They also hold to the equally simplistic assumption that all fire is the same: a chemical process of oxidation on top of which various inessential “cultural”, “social”, “spiritual” or “religious” decorations can be draped, depending on local circumstances. So for them, it seems natural to assume that the rich world’s fossil fuel dependence is something that can be “balanced out” by the rich world’s taking more control of the lands and biotic fire practices of farmers and forest dwellers in the global South. Enter REDD, carbon markets and “climate-friendly agriculture” programmes. Ignoring or disrespecting the diversity and nuanced environmental merits of thousands of vernacular fire regimes, such schemes ironically undermine the very climatic stability they claim to be promoting, allowing stupidity about fire to proliferate even further. If a single-mindedly chemical understanding of water is an instrument of oppression and environmental destruction in Bali, so too a globalized, chemical understanding of fire is being overgeneralized in a way that threatens land and forests everywhere. But as global warming worsens and fire-dependent species are driven into extinction, maybe the time has come to insist more strongly on the hidden history of fire in order to help open new spaces for popular movements. This history reveals many important facts. For example, that the grains that feed the world originate from environments regularly laced by fires caused both by lightning and by humans. For example, that in pre-Columbian times, indigenous peoples deliberately expanded the range of bison all the way to what is today New York by setting fires that created a fertile, park-like mosaic of woods and grasslands across eastern North America. 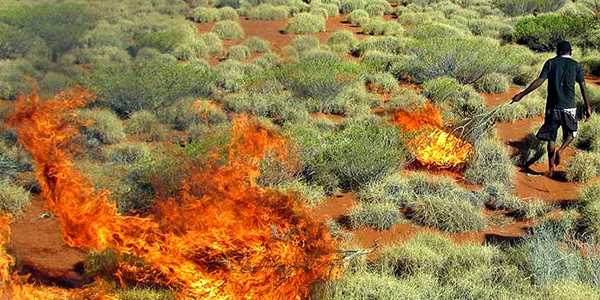 For example, that, according to growing archaeological consensus, human-set fires are in fact partly responsible for the some of the most valuable forests in the world – not only in obviously fire-prone regions like Australia, Southern Africa and Mexico, but also even in the Amazon. Once again, the belief that nature and humanity are separate categories – often attributed to the 17th-century French thinker Rene Descartes – turns out to be not just a philosophical, but also a historical, misconception. A more balanced view of fire emerges wherever people have the space and time to listen and interact democratically with local forest dwellers. In Thailand, for example, the senior state forester Wirawat Theeraprasat tells the story of how, at university, he was taught that all forest fire was bad. Only through years of dialogue with local Karen villagers as the chief of an important wildlife sanctuary did he come to realize the environmental importance of the local fire-setting practices he had been taught to look down on. The younger Karen leader, Prue Odochao, meanwhile learned when attending international climate summits how important it was to remind activists from the global North that lists of the causes of global warming should never lump together, say, Karen farmers using biotic fire on the surface of the earth and fossil fuel companies excavating coal, oil and gas from its depths. Environmental historians such as Stephen Pyne and Charles Mann – who have explained how diverse fire systems are in different times and places, and why this is environmentally important – can be of great help in opening the needed new dialogue on fire. But the discussion, as always, will be powered most of all by continuing struggle at the grassroots. Adeniyi P. Asiyanbi, “A Political Ecology of REDD+: Property Rights, Militarised Protectionism, and Carbonised Exclusion in Cross River”, Geoforum 77 (2016) 146–156, http://www.redd-monitor.org/2017/01/20/redd-in-cross-river-nigeria-property-rights-militarised-protectionism-and-carbonised-exclusion/. Mike Davis, Ecology of Fear: Los Angeles and the Imagination of Disaster (Verso, London, 2018), http://book4you.org/book/3313796/876925. ————–, “El Diablo in Wine Country”, London Review of Books 39 (21), November 2017. Silvia Federici, Caliban and the Witch: Women, the Body and Primitive Accumulation (Autonomedia, Oakland, 2017), http://book4you.org/book/2773532/e8ba20. Charles C. Mann, 1491: New Revelations of the Americas before Columbus (Vintage Books, New York, 2006), http://book4you.org/book/1634396/aea76c. Espanol: http://book4you.org/book/1189982/813d00. Stephen Pyne, “Fire Planet: The Politics and Culture of Combustion”, Corner House Briefing Paper 18 (2000), http://www.thecornerhouse.org.uk/resource/fire-planet. Ivonne Yanez, “Josefina and the Water Springs against Pine Plantations in Ecuador’s Páramos”, WRM Bulletin 211, March 2015, http://wrm.org.uy/articles-from-the-wrm-bulletin/section1/josefina-and-the-water-springs-against-pine-plantations-in-ecuadors-paramos/.